The Faculty (our further education department). The Nursery is situated in a building adjacent to our school and to our site neighbours, Pebsham Primary Academy. It is run in partnership with The 'Early Years' Nursery, and children are taught by specialist staff in a fully inclusive setting. Our Infants, Junior and Senior departments are all located on our main school site. The Faculty, our FE department, is the provision for our 16-19 year old students. It is situated in a purpose built area in the heart of Bexhill College, about half a mile away from the main school. Classes at Glyne Gap School are arranged to provide progression for all pupils, with two or three years being the usual time spent in any one class. To ensure that pupils with very profound disabilities have high staff ratios, access to intensive physiotherapy and communication programmes, there are classes in each department designed to meet more complex individual needs of pupils. Careful timetabling and planning bring all pupils of similar age together for varied activities during the week. The school is very generously staffed with teachers and teaching assistants. There is also a number of specialist staff, some of whom are employed by the school and some of whom come into school to work with pupils. These include nurses, social workers, physiotherapists, occupational therapists, speech and language therapists, a physical development teacher, a creative arts teacher and communication specialists. All specialists work in direct consultation with the pupil's class teacher who ensures that there is a balanced curriculum and that all work on priority needs of pupils. Our school is exceptionally well resourced. Alongside standardised school facilities we also have a fleet of adapted vehicles, a cafe facility, a hydrotherapy pool, a sensory room, a rebound therapy room, a soft play room, a creative arts room, and a physiotherapy room. 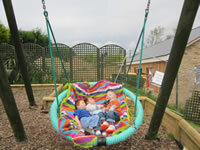 Outside facilities include an all-inclusive playground, a sensory garden, a wild garden and an adventure playground. The school operates an open-door policy. Parents who believe their child may benefit from the education provided at Glyne Gap School can contact school directly in order to make an appointment with the headteacher. Formal referrals for pupils are usually made via East Sussex Children's Authority, through a completed Statement of Special Educational Needs or Education, Health and Care Plan. However, very young children who may benefit from a nursery place may be able to come into the school without the formality of a statement. The headteacher or teacher in charge of the nursery will be able to advise on this during a visit.